It’s 2012…and who hasn’t made at least one New Year’s resolution on getting into shape? Whether you’re just starting to break out that fitness machine you were given at Christmas, or are getting back into your regular workout schedule, remember one thing: don’t overdo it. More than a few people who start working out think they can make up for lost time by hitting the weights too hard the first day—and end up with a painful injury that takes a month to heal. So if you’re dreaming about getting fit and trim this year, remember that overdoing it the first day will simply lead to unwanted injuries. Try to limit your first workouts by lowering the amount of weights you’re using, or setting your machine on low. Pain doesn’t necessarily mean gain when you’re just starting out on the exercise path. 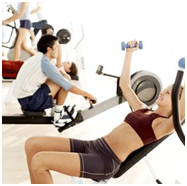 Incorporate strength training. This is a handy tip to avoid joint injuries that can often occur with a first (or second) workout. Your joints aren’t used to the stress they’re getting these first few times around, and if you aren’t in a regular exercise schedule, you need to build those muscles up. Strength training can be done with a light to medium weight dumbbell, increasing the weight as you increase your time in the gym. Use proper warm-ups and stretching. Reduce your muscle soreness commonly felt after a new exercise regime by doing proper warm-ups and stretching. Make a goal to stretch and warm-up before and after your workout. This not only helps you to avoid injury during the workout, but increases your flexibility while decreasing stiffness. Your stamina will be greater while lessening the pain. Lower back exercises: lumbar extension, the lower back lift with a Swiss ball, and lunges using a dumbbell press. Try to start out with one to two lower back exercises for 10 to 15 reps twice a week. Knee exercises: Swiss ball squats, leg lifts, forward lunges, wall squats, squats with calf raise and dumbbell press, lateral lunges, forward lunge with dumbbell, and hamstring flexion using a Swiss ball. Start with one to two exercises 10-15 reps twice a week. Shoulder exercises: push-ups, shoulder press with Swiss ball and dumbbells, dumbbell shoulder press, dumbbell lateral deltoid raise, reverse flys with Swiss ball and dumbbells, and rear delt raises with a resistance band. Activity is key to a healthy lifestyle, but so is safety! Remember to use and wear the proper gear at all times, use the right form, incorporate the exercises we’ve listed, and consult with a professional when you can. Your joints will be grateful! Hello it’s me, I am also visiting this website regularly, this web site is genuinely pleasant and the users are in fact sharing nice thoughts. I am surprised why this twist of fate didn’t happened in advance! I bookmarked it.